Sunset Beach — On October 3, 2009 Randy Wright of Horizon's West Surf Shop, Santa Monica, was kayaking 320 yards off Sunset Beach. It was 9:00 AM and he had been on the water 1.5 hours. He was using a Wilderness Tarpon Kayak, 10 feet in length, as a anchored stable platform, and a Canon 40d camera with a 24-105 mm lens inside an SPL Waterhousing. Sea conditions were flat with a measured water depth of 27 feet and 5 – 8 feet of visibility. There was a mild offshore breeze with air and water temperatures estimated at 70 and 68 degrees Fahrenheit, respectively. Several Dolphins were observed in the area in addition to schools of baitfish. Wright reported the following; “Doing volunteer field research for the SRC, I paddled my kayak out in the same area where Brian Moore, Gerry Wallfesh, Kim Welsh and many others have seen shark, believed to be GWS, breaching. 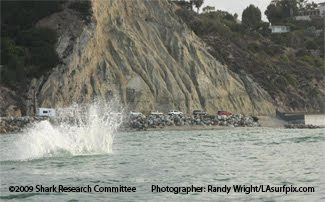 My intent was to photograph the breaching shark for research purposes. I anchored about 50 feet farther out from the buoy. I did not chum nor throw anything in the water. At 8.47 AM, I heard a large swooshing noise just east of my position in the direction of the Bel Air Bay Club. I grabbed my camera and turned to try and capture what I was vaguely seeing. What appeared to be a large animal splashing into the water about 60 feet away from me. Since I did not see it initially, I only caught a glimpse of it as it re-entered the water, noticing a lot of white on it body, but I could not tell what it was. Now I knew something was out there, but I did not believe it to be a Dolphin, since I noticed no Dolphins surface and breathe in my vicinity. Keeping my camera ready, level, pre-focused, and my finger on the shutter trigger, I continuously scanned different sections of the water. At 8:56 AM, looking towards the point, I noticed 2 guys on SUP's paddling past Chris Rozsa, who was halibut fishing in his small boat. Still looking towards the point area, at 9:00 AM exactly, I noticed some movement towards my left and quickly turned the camera and fired off 4 shots of something, I wasn't sure, airborne and then splashing. As I was not originally looking in the same exact direction, I did not see what it was, it happened so fast, but I assumed this was a shark, since I did not see any dolphins in the area surface and breathe afterwards. A local resident, Blake paddled up to me on a SUP and we conversed about what I thought I had photographed. Deciding to try and capture a photo of one of these animals with the land as a back ground, I pulled anchor and paddled 75 feet farther, dropped anchor and waited. At exactly 10:00 AM I heard another splash on my starboard side, towards the Bel Air Bay Club, but missed the animal breach, but shot the remnants of the splash. I did not see any other breaching by the time I left at 11:23 AM arriving back at Horizon's West Surf Shop at noon. Two friends, Carlos Pires and Paige Heatherington watched me unload my camera from the SPL Waterhousing and download and go over the photo's I shot that morning over the 4 hour period that I spent observing. 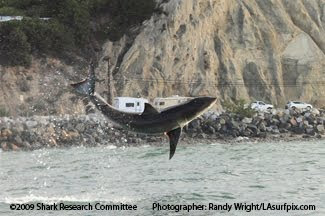 Our jaws literally dropped when image #73, 74, 75, 76 appeared, for his was the legendary breaching shark in mid-air! This was what I saw and luckily captured.” Randy has been, and continues to be, a valued SRC supporter and field observer. Based on dorsal coloration, the gray and white pattern on the pelvic fin, shape and color of the caudal fin, location and shapes of the dorsal and pectoral fins, snout and eye, the pictured animal is a White Shark, with an estimated length of 8 – 10 feet. From May 17, 2009, to today's observation, there have been more than 20 reports forwarded to the SRC of a shark breaching at Sunset Beach. 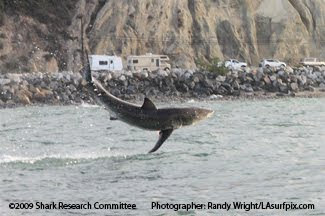 Please report any shark sighting, encounter, or attack to the Shark Research Committee.